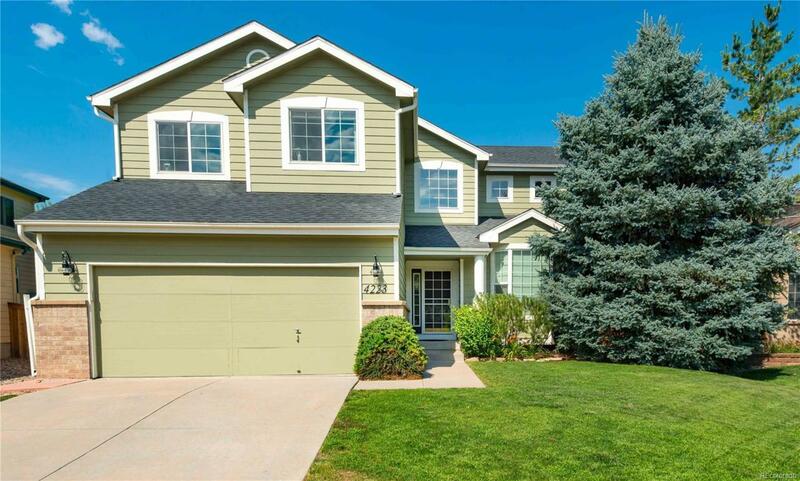 Stunning Eastridge two story backs to open space and trails within walking distance to Whole Foods, parks, shops, and Platte River Academy. You'll love the open layout, abundant natural light, and architectural interest throughout. Main level features gleaming maple hardwoods, a two story living room, a large dining room, an eat in kitchen, refinished cabinets, new hardware, new granite counter tops, new under-mount sink, a gas fireplace and built ins, and sliding doors leading to the private patio and fully landscaped yard with mature fruit trees. Upstairs is airy and bright - a sizable master is complete with a new barn door and a five piece en-suite with a granite double vanity, soaking tub and walk in closet. The location and upgrades of this home are ideal and there's pride of ownership throughout! A/C, newer windows, roof, exterior paint, water heater and more. Includes membership to four gyms and all the events and activities that Highlands Ranch has to offer. Don't miss it! Offered by The Linear Group Llc.